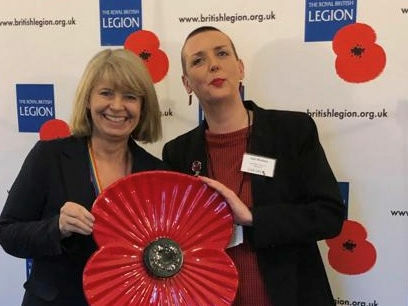 West Worcestershire MP Harriett Baldwin offered her support to the Royal British Legion at an event in Westminster this week. The Royal British Legion is the country’s largest Armed Forces charity, and provides welfare assistance for many thousands of veterans, serving personnel and their families. Harriett – who is member of the local branch in Upton-upon-Severn - was briefed on work being carried out to help working-age members of the ex-service community as well as the long-term work delivering practical assistance through community outreach services and six care homes. A network of 16 high street ‘pop-in’ centres has also been developed to make it easier for beneficiaries to seek help. Harriett commented: “As a former Defence Minister and as a constituency MP, I have seen at close hand the work that the Royal British Legion does and I know that their activities extend well beyond the annual poppy day fund-raising helping thousands of veterans and their families. Gail Walters, who is assistant director for the Royal British Legion in the Midlands, added: “I was delighted to see Harriett and we were grateful that she took the time to drop in. Photo: Harriett Baldwin MP with the Royal British Legion’s Gail Walters.